Monday, 23 February, 2009 - David Donald - Janes Two years ago the Caracal pistol programme was launched at IDEX. Now, the UAE manufacturer has launched a third member of the Caracal family – a subcompact (SC) variant with several innovative features. Caracal has its roots in the Small Arms project, launched by the UAE in 2002. Design of the Caracal range and its accessories is led by renowned handgun designer Wilhelm Bubits. Initial products launched in February 2007 were the Caracal F (full – with 18-round capacity) and Caracal C (compact – with 15-round capacity). Both are available in 9mm or 0.357in calibre and a wide range of accessories is available. Caracal identified a need for an advanced sub-compact pistol for personal security and law enforcement use, and so launched the SC. Rather than just reduce the length, as is common with most subcompacts, the SC also has a considerable reduction in width, from the 28mm of the F and C, to just 23.5mm. The SC has a standard magazine for 13 x 9mm rounds – more than other sub-compacts. 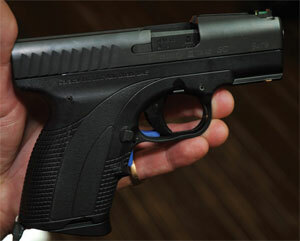 Moreover, by means of a simple adapter, the SC can take the larger magazines from other 9mm Caracal weapons. Other new features are a separate safety switch located beneath the trigger guard, rather than on the trigger itself. The SC also has a solid synthetic striker, resulting in reduced manufacturing costs and a very smooth action. The synthetic unit will be introduced to the F and C series later this year. An option for all Caracals is the Quick Sight. This has the rear sight moved forward so that it is just a few centimetres behind the front unit. Using the sight, rapid aiming is highly intuitive and accurate.